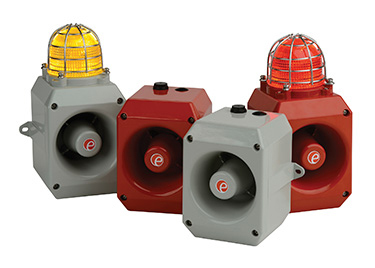 For use in harsh environments where high temperatures, shock and vibration or high UV levels are anticipated, E2S has introduced the new D range of alarm sounders and combined sounder/beacon warning signals. Using the electronics of its well-established A Series, the D range is housed in a robust, corrosion resistant LM6 aluminium alloy enclosure, giving greater mechanical, temperature and UV protection than an equivalent plastic bodied device. The D105 is rated at 112 dB @ 1m and the D112 at 117 dB @ 1m; both types are also available combined with a Xenon strobe or LED beacon to generate both an audible and visual alarm from a single unit. Testing has proven that a metal housing offers far greater protection at elevated temperatures than a plastic enclosure and is especially suited to outdoor applications such as mining conveyors where high ambient temperatures and sustained vibration can be experienced. Both units offer a choice of 45 different alarm tones, and with the option of activating a second and third tone via additional control cables, they are a cost effective sophisticated signalling solution that offers the versatility of multiple tones from a single unit at a lower cost. The devices can operate from 12V, 24V and 48VDC as well as 115V and 230VAC. A UL approved version is also available. E2S has more than 20 years experience in designing and manufacturing a comprehensive range of sounders, beacons, loudspeakers, voice alarms and disaster sirens for the oil & gas, hazardous area, industrial and marine markets.